From left to right: Sen. Marco Rubio, Donald Trump and Sen. Ted Cruz during the Fox Business Network Republican presidential debate at the North Charleston Coliseum and Performing Arts Center on Thursday in North Charleston, South Carolina. In a few weeks’ time, it’s possible that Donald Trump and Ted Cruz will steamroll their way through Iowa, New Hampshire and South Carolina and dominate the so-called “SEC Primary” — the collection of 12 mostly Southern states that will vote on March 1 — horrifying many GOP elected officials and depriving any other candidate of a night to celebrate. Yet even if that happens, it’s still possible that Marco Rubio (or another more establishment-friendly candidate) could end up with the nomination, thanks to quirks of the GOP’s complex delegate math. The GOP’s primary calendar is surprisingly front-loaded with states friendly to insurgents like Trump and Cruz. But because of Republican National Committee rules, all but one of these states will award their delegates on a proportional basis, intentionally making it difficult for any one candidate to build a durable or commanding lead. Instead, Florida and Ohio, which tend to support more conventional Republicans, are likelier to shape the race’s destiny than Iowa or South Carolina. That’s because they will award a whopping 99 and 66 delegates, respectively, in huge winner-take-all primaries on March 15. These are the findings of a new joint FiveThirtyEight and Cook Political Report project to map out each top GOP contender’s unique route to amassing the 1,237 delegates required to clinch the nomination at the national convention in Cleveland. Although there is still plenty of time for Trump or Cruz to falter or for another candidate to rival Rubio for the mantle of “establishment” front-runner, for now, this is functionally a three-man race. The project relied on a three-step process. First, we utilized three variables — education, religious affiliation, and state and congressional district partisanship — to model Trump’s, Cruz’s and Rubio’s geographic support in primaries and caucuses from February through June. Based on recent polling, we assume Trump will fare best in states and districts with small shares of college graduates, while Cruz’s hallmark will be strong support in places with large shares of evangelical protestants. We also assume that Rubio, like previous “establishment” favorites, will perform well in bluer and more highly educated states and districts, but will underperform in caucus states. To account for favorite-son effects, we also built in a modest 5 percent boost for each candidate in his home state. Next, to map out how that support might translate into delegates, we exhaustively examined the often-byzantine delegate allocation rules in each contest with the help of great research by Ballotpedia. Except for South Carolina, all states holding contests before March 15 are required by the RNC to allocate their delegates proportionally. From then on, it’s high-stakes poker: By our math, 63 percent of delegates at stake in contests March 15 or later will be awarded on a winner-take-all basis, either statewide or by congressional district. Finally, we calculated individualized, state-by-state delegate targets for each candidate. Think of these as akin to a runner’s “split times” over the course of a marathon. For example, we estimate that to be “on pace” to win the magic 1,237 delegates out of the 2,472 at stake nationally, Cruz would need to win 47 of South Carolina’s 50 delegates, while Trump would need 38 and Rubio would need just three. The result is a convenient tool to help you judge GOP candidates’ true progress toward the nomination after each primary. 1. Each top GOP contender has a very different path to the nomination, but keep an eye on where those paths converge. Rubio’s ideal path would rely heavily on coastal, New England, Middle Atlantic and Great Lakes states. Cruz’s would rely heavily on the Deep South, the conservative heartland and Texas. Trump’s would likely depend on a broader coalition of Southern, Midwestern and Northeast industrial states. However, we estimate that all three candidates’ routes run through the winner-take-all bellwethers of Florida, Ohio and Arizona — all of which contain natural elements of support for each contender. If one candidate were to win both Florida and Ohio and claim their jackpot of 165 delegates, it would be extremely difficult for any other candidate to overtake him. Meanwhile, a Florida/Ohio split would almost surely prolong the race into April. 2. Beware an early, modest lead for Trump or Cruz. Our estimates show that Cruz would need 543 delegates heading into the March 15 primaries to keep pace for the nomination, and Trump would need 458. However, Rubio would need only 359. In other words, the GOP calendar is front-loaded with insurgent-friendly states. Although Rubio can’t afford to get clobbered early by missing thresholds in SEC states (see No. 3 below), he merely needs to stay within striking distance. 3. Delegate “thresholds” and “triggers” can make or break candidacies. Most proportional states require candidates to hit a minimum threshold of support to win delegates. For example, if Rubio were to receive 21 percent of the vote in Texas, he would win nine of Texas’s 44 at-large delegates. But if Rubio were to receive 19 percent, he would receive zero, thanks to Texas’s 20 percent threshold. Additionally, many states have “trigger” clauses that award all their delegates to a candidate who wins at least 50 percent of the vote. For example, if Trump were to win 49 percent of the vote in Michigan’s primary, he would win roughly half the state’s 59 delegates. But if he were to capture 51 percent of the vote, he would double his take. “Triggers” are really the only way a leading candidacy could turn into a runaway train. The smartest candidates will know how to exploit these idiosyncrasies, much as Barack Obama did so well in the 2008 Democratic primaries. Wise campaigns will avoid wasting lots of time and money in states like North Carolina, where winning 1 extra percentage point might net only one additional delegate. Instead, they will exert resources in winner-take-all states and states where thresholds will make the difference between winning dozens of delegates or zero. 4. If any early state is critical, it’s probably New Hampshire. A Trump or Cruz win in Iowa could add to moderate Republicans’ urgency to coalesce behind an alternative. Rubio doesn’t need to win New Hampshire, but to move up nationally, he will need to finish ahead of Jeb Bush, John Kasich and Chris Christie by a clear margin. One other thing: If Bush and Kasich depart the race after poor New Hampshire showings, Rubio could benefit enormously by consolidating support in their Florida and Ohio backyards ahead of March 15. 5. 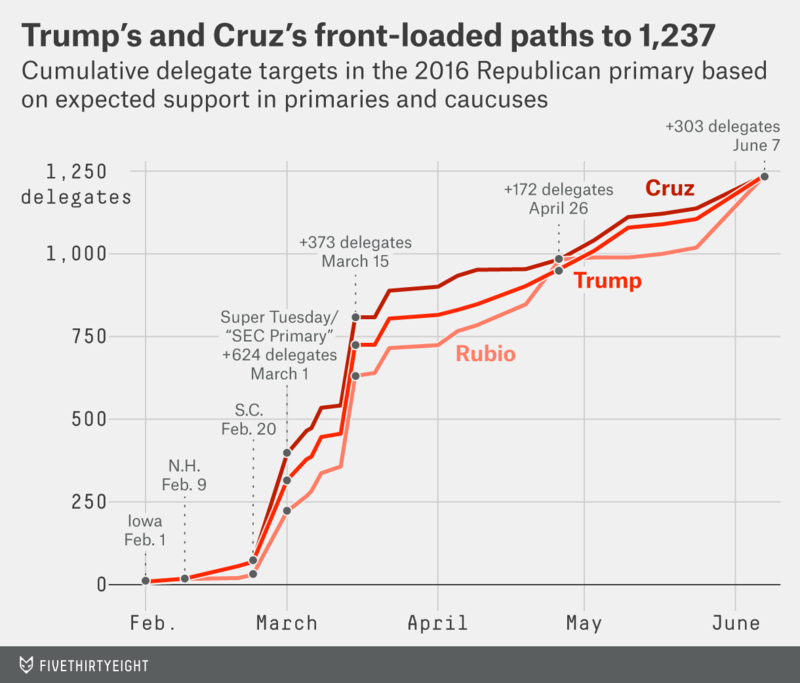 It’s quite possible that no candidate will end up with 1,237 delegates by June. Early on in the season, it’s likely that no single candidate will hit his target numbers. That’s because with a crowded field of contenders, it will be difficult for even leading candidates to amass large numbers of delegates. But the longer the race goes without Trump, Cruz or Rubio coming close to hitting his cumulative targets, the higher the odds of a contested Cleveland convention. Notes on the math: In calculating the delegate targets above, we had to make some judgment calls. For example, little data exists to model candidate support in American Samoa, Guam, the Northern Mariana Islands, Puerto Rico and the U.S. Virgin Islands. However, in 2008 and 2012, these territories gave almost all their support to the “establishment” candidate. To be conservative, we assume each territory will give two-thirds of its support to Rubio. Furthermore, Colorado, North Dakota, Pennsylvania and Wyoming will send most or all of their delegates to the convention as “unbound” to a single candidate. In many other states, three RNC officials are automatic delegates and are not required to pledge support to a candidate before the convention. Lacking a better method, we assume they will vote in proportion to candidates’ estimated support shares in their states’ primaries, caucuses and conventions. If anything, that’s probably generous to Trump, who lags far behind other candidates in support from party officials. CORRECTION (Jan. 21, 11:10 a.m.): A previous version of this article misstated the number of delegates at stake in Colorado and Ohio, as well as the date of Colorado’s state-level GOP convention. Colorado has 37 delegates, not 31, and Ohio has 66, not 72. In addition, Colorado’s state-level convention will be held on April 9, not March 1. Because of these errors, several other figures in the article had to be changed. There will be 12 mostly Southern states that will vote on March 1, not 13. Of the delegates at stake in contests on March 15 or later, 63 percent will be awarded on a winner-take-all basis, not 65 percent. If one candidate wins Florida and Ohio, the candidate will claim 165 delegates, not 171. Ted Cruz would need 543 delegates heading into the March 15 primaries to keep pace for the nomination, not 555; and Donald Trump would need 458, not 469. Marco Rubio would need 359 to keep pace, not 371. CORRECTION (Jan. 19, 12:13 p.m.): Previous versions of the table and chart in this article incorrectly listed Rubio’s projected cumulative delegate goal for March 1. Under the forecasts used in these calculations, he would have 236 delegates, not 282.